The purpose of these ships is to replace the Protecteur Class AOR's which were commissioned in 1970. Now over 40 years old, they have been in need of replacement for some time. 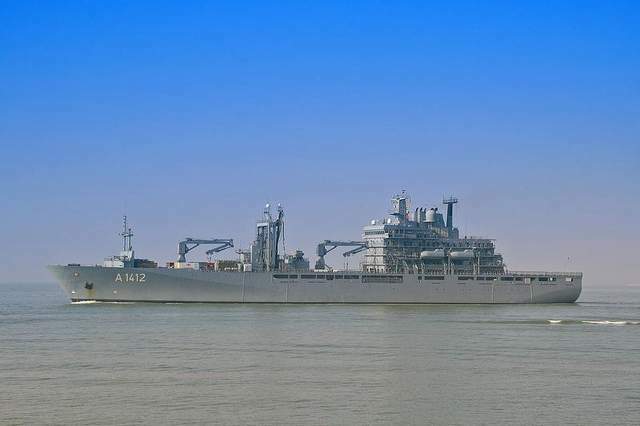 The Berlin class, also known as the Type 702, is a large Auxiliary Oiler Replenishment ship. It has been, by some accounts, the Royal Canadian Navy favorite since the shift from a multi-purpose JSS concept to an AOR type was first made official. As it stands now TKMS will prepare the design package for Vancouver Shipyards Co. Ltd to review in preparation for actual production, and part of that process will involve definition contract negotiations between Vancouver Shipyards Co. Ltd. and the Canadian government. Once these steps are complete, Canada will acquire the license for the ship design, allowing in-country production and support. In the beginning the Navy was looking for a very different kind of ship. In 2006, the Canadian government issued an RFP that began the process of defining and building 3 “Joint Support Ships.” The original aim was to deliver 3 multi-role vessels with substantially more capability than the current Protecteur Class oiler and resupply ships. In addition to being able to provide at-sea support (re-fueling and re-supply) to deployed naval task groups, the new JSS ships were envisioned as ships that would also be capable of sea-lift operations, as well as amphibious support to forces deployed ashore. It can be argued that the program to replace the Protecteur class has been no more protracted then any other DND procurement program of the last decade. In 2004 the federal government announced that it was commencing the Joint Support Ship Project. Originally, there were four syndicates vying for the contract, led by Irving Shipbuilding, BAE Systems, ThyssenKrupp Marine Systems Canada, and SNC-Lavalin ProFac. Two design finalists were selected in November 2006: ThyssenKrupp and SNC-Lavalin ProFac. Under the two remaining proposals, the ships will be built in either Marystown, Newfoundland or Victoria, British Columbia, respectively. A contract for final design and construction was expected in 2008, with the first ship of the class entering service in 2012. In January 2007, Canadian media reported that defence planners were considering the retirement of the existing Protecteur class ships by 2010, prior to the delivery of the first replacement vessels in 2012. This news was met with criticism as it would leave the RCN without an underway replenishment capability for two years. On August 22, 2008 the Minister of Public Works and Government Services, Christian Paradis announced the termination of two procurement processes involving the shipbuilding industry. In December 2008 RCN officers and defence analysts had been hoping that January's federal budget would have contained up to $500 million in extra funding for the Joint Support Ship Project so that it could be completed. In the same month Defence Minister Peter MacKay suggested that the budget stimulus package would deal with the RCN's shipbuilding needs. However, there was no extra money for the Joint Support Ship Project and the stimulus package did not address the RCN's vessel procurement programs. Vice-Admiral Denis Rouleau, spoke to the Standing Committee on National Defence in the House of Commons and indicated that the Department of National Defence would know by summer 2009 how it would move ahead with the Joint Support Ship Project. In June 2009 officials with the Joint Support Ship Project began re-evaluating the type of ship they wished to purchase since the original concept could not be met with the money the government was willing to provide. One option would be to start from scratch and purchase a different type of ship altogether. In September 2009, the Joint Support Ship Project received a new design. Vice-Admiral Dean McFadden, Chief of the Maritime Staff, said that he was ready to submit design and cost estimates to the government and to the Minister of National Defence. In June 2010 the Government of Canada announced that the National Shipbuilding Procurement Strategy would see $35 billion spent over the next 30 years to purchase 28 new large ships and 116 small vessels for the Royal Canadian Navy and Canadian Coast Guard. The NSPS was headed by the government's procurement arm, the Department of Public Works and Government Services, with support from Department of Industry, as well as the 2 departments responsible for the RCN and CCG, the Department of National Defence and Department of Fisheries and Oceans respectively. In July 2010, Defence Minister Peter MacKay announced that under the NSPS the federal government would initially purchase two joint support ships (at a cost of $2.6 billion) with options for a third. On October 11, 2010 the Government of Canada announced that five shipbuilding companies were "being invited to participate in a request for proposals" for the National Shipbuilding Procurement Strategy. On October 19, 2011, the Government of Canada announced the results of the competitive evaluation of bids in the National Shipbuilding Procurement Strategy which saw the $8 billion non-combat ship package, including the Joint Support Ship Project, awarded to SeaSpan Marine Corporation in Vancouver, British Columbia. While Canada was following this tortured path to the Berlin class the Netherlands was forging ahead building the kind of ship that Canada originally wanted. Around the same time that Canada began its search for a Protecteur replacement, the Dutch undertook a similar program, and developed a similar set of requirements. While Canada balked at the cost, the Dutch developed the Karel Doorman class support ship. The first Dutch vessel will be delivered in 2014. It is interesting to compare this ship, both to the Berlin class we will be getting and to the original JSS. · Cargo space: approx 400 tonnes of ammunition and other supplies. · Sensors: Thales Nederland Integrated Mast, Thales SeaMaster 400 SMILE Air Warning radar, Thales SeaWatcher 100 SeaStar Surface detection radar, Thales Gatekeeper electro-optical surveillance system. This is essentially the ship we first envisioned. We have decided that we can’t afford it. The Dutch ships will be built at the Damen yard in Galati, Romania and then towed to Vlissingen, The Netherlands where final outfitting and installation of the weapon systems will take place. In Canada, of course, this would be impossible, under the terms of the government’s new ‘made in Canada’policy, (6) let alone the National Ship Procurement Strategy, (7) it must be built in Canada and only at SeaSpan Marine Corporation in Vancouver, British Columbia. This is not a formula for efficiency or low-cost. Nor does it appear to be a successful strategy for getting the R.C.N. the ships the country wants.